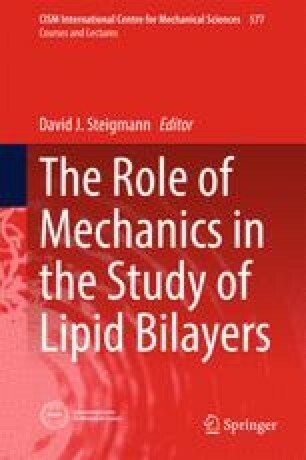 In this chapter we review recent work by the writer and coworkers on various aspects of the mechanics and physics of lipid bilayers. A framework for lipid bilayer surface, based on a dimension reduction procedure applied to three-dimensional liquid crystal theory, is reviewed in Sect. 1. This accommodates the non-standard effects of lipid distension and tilt. A special case of the general model in which tilt is suppressed but distension, and accompanying surface dilation, are permitted, is also derived. This is further specialized, in Sect. 2, to obtain a model of the classical type, due to Canham and Helfrich. Our approach facilitates understanding of the place of the classical theory, and its logical extensions, in a larger context. Section 3 provides a further development of the theory with surface dilation—reported here for the first time—to accommodate dissipative effects, including intra-membrane viscous flow and the diffusion of trans-membrane embedded proteins. This may be viewed as a theory of generalized capillarity, accounting for various higher order gradient effects of the Cahn–Hilliard type in the constitutive equations. A simpler variant of this model is described in Sect. 4, in which non-standard gradient effects are suppressed. This furnishes the simplest thermodynamically consistent extension of the classical theory to cover diffusion and viscosity. Finally, Sect. 5 is devoted to the electromechanical theory. This is limited to the simplest extension of the classical model to accommodate surface flexo-electricity and the coupling of surface shape with a polarization field. Restrictions on the latter, consistent with the three-dimensional electromechanical theory for liquid crystals, yield a relatively simple generalization of the classical theory appropriate for analyzing membrane response to a remote applied electric field.